I’ve written a couple of posts (here and here) about TheFormTool, an add-on to Microsoft Word that makes it extremely easy to create document templates and generate documents based on those templates. This week, the developers of TheFormTool gave a sneak peak of a forthcoming product that they have code named REACH. REACH is an enhancement to TheFormTool Pro that extends its document-assembly capabilities from a single document to document automation for groups of documents. 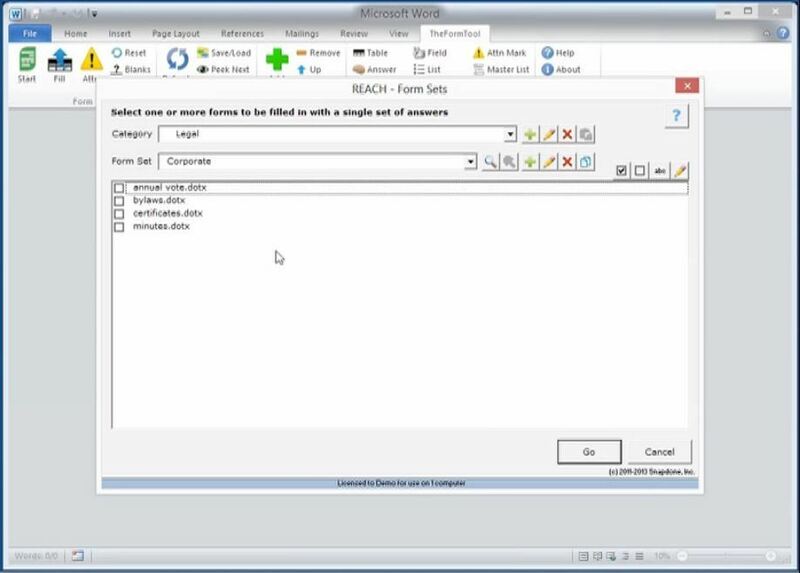 In much the same way that TheFormTool allowed you to generate a single document, REACH will allow you to generate multiple documents in one fell swoop. A corporate document set in REACH. For a basic understanding of how TheFormTool works, see my initial review. In short, TheFormTool enables you to easily add a Q&A table to a document in order to create a template. Once you’ve created the template, simply answer the questions (such as, “What is the name of the purchaser?”) and the appropriate fields are filled out in the document. REACH extends this basic functionality by enabling you to create sets of yours document templates. A set might be for a type of matter — a divorce, for example — or a set might be created around a task, such as a simple estate plan. Once you’ve created a document set, you will now be able to answer a single set of questions and use your answers to fill out and generate all the documents in the set. In this week’s preview, this functionality was demonstrated using a set of corporate forms that contained four documents: annual vote, bylaws, certificates and minutes. Select which documents from this set you want to complete — it can be any or all — and REACH extracts the Q&A tables from all the documents and builds a compiled table that includes all the information required by all the templates. Fill out the Q&A once and generate all the documents. Plus, the Q&A tables are compatible across documents once you save your answers for a particular matter. If you’ve saved answers in a single form, they are available to the set; if you’ve saved answers in the set, they are available in each separate form. The company said that this is REACH 1.0, with further enhancements scheduled for later this year and early next year. The next version will add a “library” feature that will let you grab and insert selections of boilerplate text. A later version will add a “sequel” feature that will enable you to pull information from databases such as SQL, Excel and CSV. REACH will be released in beta in early November and will be released for full public distribution in December. The price has not been set but REACH will be sold on a subscription basis. The subscription will include a package of features that will include priority for receiving service from the company and priority access to a new “Formers’ Market” where form authors will be able to share and sells forms they’ve created. A video presentation on REACH can be seen here.